It may be the happiest season of the year, but higher oil prices that have translated into gasoline prices topping $3 a gallon have many motorists frowning. According to the latest survey by the AAA motor club, the nationwide average for a gallon of regular unleaded fuel surpassed $3 a gallon Thursday, its highest level in more than two years. Thursday's average rang in at $3.01 a gallon, compared to $2.98 a week ago, according to AAA's Daily Fuel Gauge Report. Prices were highest in states known for high fuel costs, including New York, California, Alaska and Hawaii, where prices ranged from $3.27 a gallon in New York to $3.64 a gallon in Hawaii. Prices were lowest in Colorado, where they averaged $2.76 a gallon. The average price of fuel has climbed steadily since reaching a low of $1.62 a gallon in December 2008, CNNMoney.com noted. Still, that's well below the $4.11 a gallon recorded earlier that year in July. "We've never had Christmas Day with gasoline at $3 or higher," says Tom Kloza, chief oil analyst with Oil Price Information Service, an energy trade publication based in Wall, N.J.
What's causing the rise in oil prices? Many analysts blame the weak U.S. dollar, although expectations of a more robust economic recovery in the coming year have also helped push oil to over $90 a barrel in trading on commodity markets. In early trading Thursday, oil prices were up fractionally to $90.53 a barrel on the New York Mercantile Exchange. Crude futures rose above $90 a barrel on Wednesday, after the American Petroleum Institute, a trade group, reported U.S. oil stockpiles fell by 5.8 million barrels in the week ending Dec. 17. The decline was much larger than analysts had expected. In a report later Wednesday, the Department of Energy confirmed crude supplies had dropped by more than 5 million barrels, which analysts attributed to year-end inventory adjustments rather than higher demand or shortage of imports. Still, AAA doesn't expect that higher fuel prices will keep Americans from hitting the nation's highways this holiday season. The organization predicts 85.7 million people will travel by car to their holiday destinations, a 3.2% increase above last year, CNNMoney.com reported. 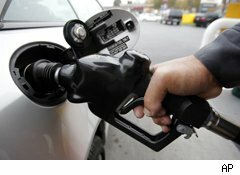 The rise in gas prices also isn't expected to put a damper on economic growth in the New Year. Economist Zach Pandl of Nomura Securities told the MarketplaceMorning Report radio program there are good reasons and bad reasons for oil price increases. The recent rise is good because it's being caused by a gradual increase in demand, he said. "The kind of increase we're seeing today, although it's uncomfortable, it probably doesn't have a very large impact for the economy as a whole," Pandl said. Higher prices for crude also translate into greater costs for home-heating fuel, a dominant source of heat for homes in the Northeast. Futures contracts on heating oil for January delivery rose 1.2 cents, or 0.5%, to $2.53 a gallon on Wednesday, the highest settlement price since Oct. 3, 2008, Bloomberg News reported. That means even consumers in New England and states such as New York and Pennsylvania who plan to stay put for the holiday season will still see their wallets thinned by the run-up in oil prices. That's a very Grinchy turn of events indeed.